Maine Sports Media: Blame it on the Economy? How about Losing? Blame it on the Economy? How about Losing? Newsday is reporting that Rutgers University is considering "scaling back" some of the plans for the construction of their new stadium. What's to blame? THE ECONOMY!!! Wow, haven't heard that one before. Expect to hear this excuse not only in the college ranks, but in professional sports as well. It's a great excuse right now. For Rutgers, it covers up what may be the real reason...a 1-5 season so far. For a construction campaign that is STILL 30 MILLION dollars short, it is easy to blame the stock market. But lets be honest...How many donors are willing to give six figure checks to an athletics department that doesn't have a consistent winner. Greg Schiano has done a great job turning that team around, but is it even close to being a powerhouse? Absolutely not. Recruiting isn't going to get any easier for Rutgers in the northeast, especially with the resurrection of Penn State, the potential of Lane Kiffin at Syracuse, and the steady play of UConn. Schiano's Miami roots are drying up as well, with the improvement of the Florida schools. 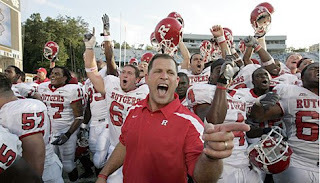 Plus, Schiano may be coaching elsewhere soon. Winning is no longer a given in Jersey. Does the economy have a hand in this possible decision? Yes...but never forget what the most important thing in sports will always be...winning. You think Kiffin is going to coach at Alzheimer Al's alma mater? That would be interesting.